Sure, most of us wanted to create something unforgettable. Whether your dream became a true or not, that is different story. Do you think that artists are still people who use easels, brushes and chalk? Or they still use pianos and violins? Sure, some of them do. But in modern era some of them became electronic-based artists. Those who use computers as their tools. Most people think (and maybe they are right) that Mac is the best friend of artist or musician. But are there any open-source projects oriented to people with creativity talent? Yes, there are. I have already told you about one of them: dynebolic. Today I will tell you about another one. Puredyne. Actually, Puredyne is not a project grown on the empty space. I would say it has dad and even granddad. Dad is... dynebolic. Yes, Puredyne project was inspired by Dynebolic. They have lots in common. And most important, both are oriented to creative people. Granddad is... Ubuntu. Yes, Puredyne is based on Ubuntu. To be more precise, Xubuntu, one of many Ubuntu remixes. Latest release of Puredyne has version number 9.11 and nickname "Carrot and coriander". It is dated March 2010. Puredyne is initially oriented to Live usage, although it has installation features. But native method of Live USB creation is too long and windy. Even quick glance on that method fought off any wish to start it. That was a time for me to try methods of Live USB creation. Unfortunately, Unetbootin does not support Puredyne. USB drive created by Unetbootin was not bootable. That's why I tried methods with command dd and command cat. And miss again. Unfortunate for 3rd time in a row, I decided not to waste more time and use more classic method. Finally, CD-RW was burnt. It is in the drive of my Compaq C300 laptop. Reboot. Choose to boot from CD. Let's go! Puredyne booted itself OK. There was only one question: which version to boot, normal or failsafe. Of course, my first attempt was for normal version, and I got it right. Once booted, I got to XFCE 4 desktop environment. 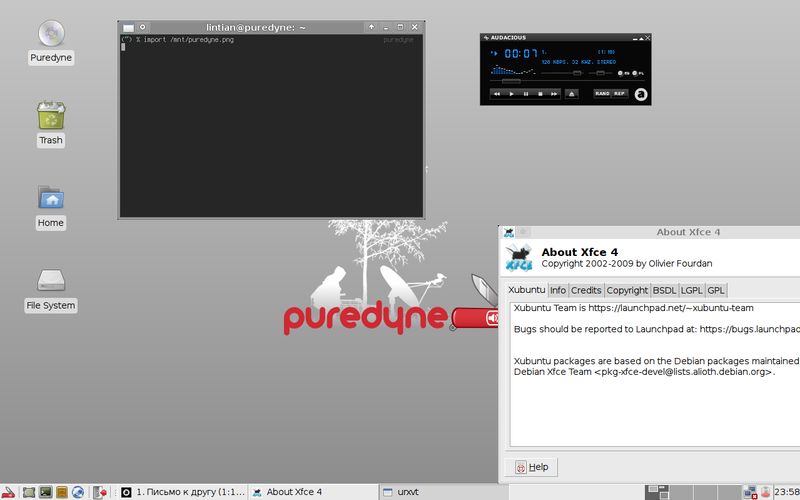 Yes, as I wrote before, Puredyne is based on Xubuntu, which is Ubuntu with XFCE Desktop Environment. All the control elements of Puredyne are well known to people who ever worked with XFCE, or even GNOME. Yes, from certain point XFCE and GNOME are very similar Desktop Environments. Desktop of Puredyne is not something fancy. It is simple and neat. Grey background with Puredyne logo on it. Of course, this is red Swiss army knife. Yes, there is about a dozen of other XFCE-centered wallpapers in the distribution, but for my taste, default wallpaper is the best. There are no "eye-candy" toys on default screen. It underlines that Puredyne was created for work, not for entertainment. Yes, creative work, but still work. Network: to be or not to be? Unfortunately, Broadcom 4311 WiFi card was not activated automatically by Puredyne. Sure, it was only included in Ubuntu version 10.10 released more than half a year after Puredyne. I found a Launchpad bug report about this WiFi card and its firmware. That bug report advised to deactivate (delete) driver for Broadcom devices and install another one via Synaptic. I connected my laptop to wired Internet and tried to follow the instructions, and I found necessary item in Synaptic. It requested a dozen of other packages to be downloaded as dependency, mostly kernel update to 2.6.31 level. Unfortunately these updates were not found on server, and therefore Broadcom STA driver was not installed. That might be an issue of server actually, not Puredyne. I tried to update my Ubuntu same day using same UK mirror, and again some packages were not found there. That's why I can't tell for sure whether this is Puredyne issue or not. Anyway, all my network-oriented activities were cut short. Basically, the b43 driver is broken. We are turning this bug into a question as it seems this is more related to installation troubleshooting and process rather than reporting a defect. Maybe I missed something in my life, but since when broken driver became installation troubleshooting? If something is broken in the distro, it has to be fixed by developers, not troubleshooted by users! Applications: what is in the box? Puredyne is Linux distribution for creative people from creative people. That is a slogan from official web site (yes, slightly reworded). That's why software in this distribution has very specific orientation. Of course, there is a lot of Audio and Multimedia tools. What is nice, VLC is included into the distribution, and this hints the fact of MP3 support out of the box. VLC is actually a default player for MP3 files. Although, there is a huge issue with VLC. It starts with HUGE fonts, making it unusable without proper adjustment. Anyway, MP3 files played fine in VLC, Audacious 2 and GNOME MPlayer. Other than MP3 players, there are mixers, Brasero disk burner and couple of dozens of other multimedia applications purpose of which I cannot even imagine. Did I ever mention that work of electronic artist/musician is easier than work of pianist or violinist? No, I did not. Graphical section of menu has several applications, including Inkscape and GIMP. But there is no graphical screenshot tool. Quick search in the Internet gave me advise: command import. So, screenshot which you see here was taken by this tool. Mozilla Firefox 3.5.8 and Links 2 are browsers included in the package. gFTP is FTP client and also there is Sun Java starter. That's all for network tools. Not much, errgh? Office applications in Puredyne are represented by ePDFViewer and Orage. No text processor (except Gedit), spreadsheet or presentation tool. I can understand first and second, but later would be useful for multimedia-oriented distro somehow. Anyway, that's not a big deal to install it, I believe since Puredyne is based on Ubuntu and uses Ubuntu repository. Puredyne found all the partitions on HDD of my laptop. But none of them was automatically mounted. I do not understant why. What is wrong about this? I had to give mount command manually. Of course, it worked OK even for NTFS partition. Russian keyboard layout can be easily added in Settings menu section. But, as in Linux Mint XFCE, it does not automatically put any kind of indicator at the taskbar. In order to have layout indicator, I had to add element to the taskbar by right click. Puredyne is pretty much purpose-built Operation system. It clearly positions itself as OS for artists. That's why I see no point for other users to install it. Unfrotunately, latest release of it is dated March 2010, i.e. even before current LTS version of Ubuntu, on which Puredyne is based. It means that lots of components of Puredyne are currently outdated and require update. But that should not stop people who prefer good collection of targeted applications under one roof. Puredyne is irreplaceable tool for them. Sounds like you burned a CD which is a lite version. There is also a DVD with a _lot_ more more software. Please consider a fresh review or a rewrite as there seems to be a few errors here that put PD unfairly in a bad light. I thought I clearly stated that I used CD. I prefer to use CD because of my hardware problems. I don't think this review is negative. It is neutral from my perspective. If you see any errors here, please let me know either here or by e-mail. I will re-consider the text.